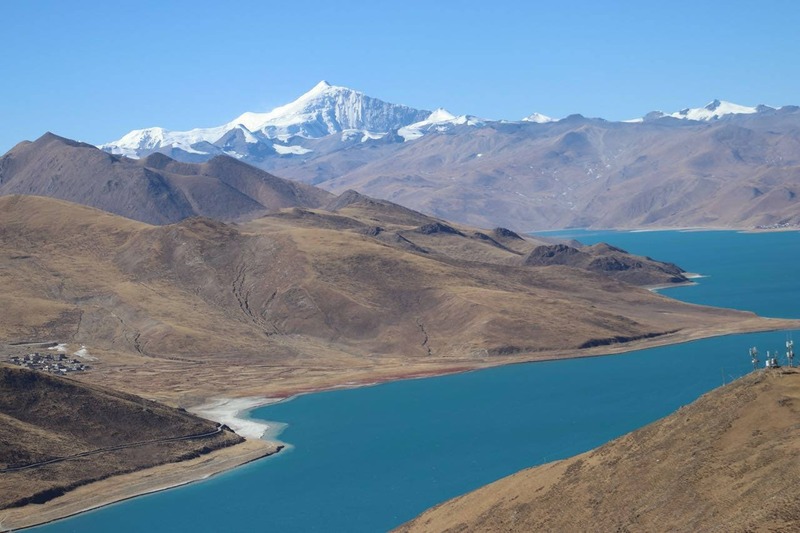 Yamdrok lake or Yamdrok Tso (Tibetan: ཡར་འབྲོག་གཡུ་མཚོ) is a freshwater lake. It is one of the four sacred lakes in Tibet, (the other three are Namtso Lake, Lake Manasarovar, and Lhamo Latso) and the third largest holy lake. It is stretching over 72 km in length and is 60 meters deep at the lowest point. The lake is located at the altitude of 4,441 meters/ 14,570 ft above the sea level. However, the best viewpoint is located even higher, just below the Kambala Pass (5,300 meters) at the elevation of 4,800 meters. Yamdrok is famous for its incredible turquoise color. Its water is rich in minerals, that give the lake this color. The color can range from light turquoise in the direct sunlight to the deep rich blue in cloudy weather. The water of the lake is crystal clear with low sediment. Fish lives in the lake, and you can sometimes see it when you get close to the water. However, Tibetans don’t eat fish. First of all, they believe that spirits living in the lake should have fish for themselves. The second reason is that Tibetans would never disrespect the sacred lake, that’s why they don’t take anything from it and don’t swim in it. The lake is filled up by water from precipitation and melting snow and ice from the surrounding mountains. The water level remained high as Yamdrok was only feeding one tributary of Yarlung Tsangpo (Brahmaputra River). In recent years, construction of Hydropower Station was completed on the lake. It generates energy from the Yamdrok lake water dropping over 800 meters through a tunnel to the Yarlung Tsangpo river. Yamdrok Lake is located in Nangartse (Nakartse) County of Shannan Prefecture. It is 110 km southwest of Lhasa and about 90 km to the East from Gyantse. It is surrounded by high snow-capped mountains. On a clear day, you can see the peak of the Mount Nojin Kangtsang (7,191 meters). The viewpoint place is located on the mountain road going from Lhasa to Gyantse and then further to Shigatse. One of the largest towns on the lake is Nangartse, although travelers rarely stay there. Most of the tours visiting Yamdrok Lake, continue towards Gyantse and Shigatse. The town of Nangartse is relatively small, with some old buildings. One of the main attractions is the Samding monastery 10 km to the East of Nangartse. 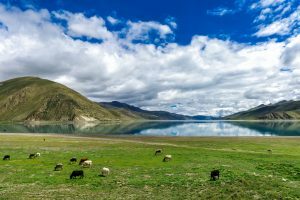 Vast pasture land surrounds Yamdrok Lake, and you can see many herd animals grazing on its shore. The monastery is famous because it’s the traditional head is the female incarnation of the Lama Dorje Phagmo. The abbess is the third most important Lama in Tibet, after the Dalai Lama and Panchen Lama. The monastery dates back to the 12 century and belongs to the Bodongpa school of Tibetan Buddhism. Both monks and nuns reside in the monastery. Yamdrok Lake is a sacred lake for Tibetans, and many pilgrims walk around it. It takes about seven days to walk around it, and some Tibetans complete the Kora or circumambulation with prostrations. If you are staying in the Nangartse town, you can hike to the Samding monastery. It only takes a couple of hours and at the end, you will be rewarded by the great views from the monastery hill. There are also great camping sites near the lake. 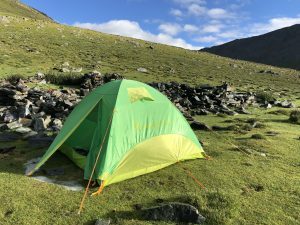 If you want to spend more time walking by this magnificent lake, taking photos of migrating birds or visiting the monastery, you can camp here for a night. Most of the tourists traveling from Lhasa to Everest region and further to the West make a stop at the Yamdrok Lake. 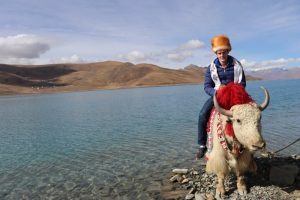 It attracted many local Tibetans who now offer taking photos with local animals. You will see there Tibetan mastiff dogs, white yaks, and goats. It is a great opportunity to get close to these animals and take a great photo. You can only see white yaks in very few places in Tibet. One of these places is Yamdrok lake, and another one is Namtso lake. Most of the animals are also decorated with colored furs, bells, and other items. Later in the fall (usually during late fall and winter), birds migrate to the Yamdrok Lake. You can see some of them in their natural habitat. 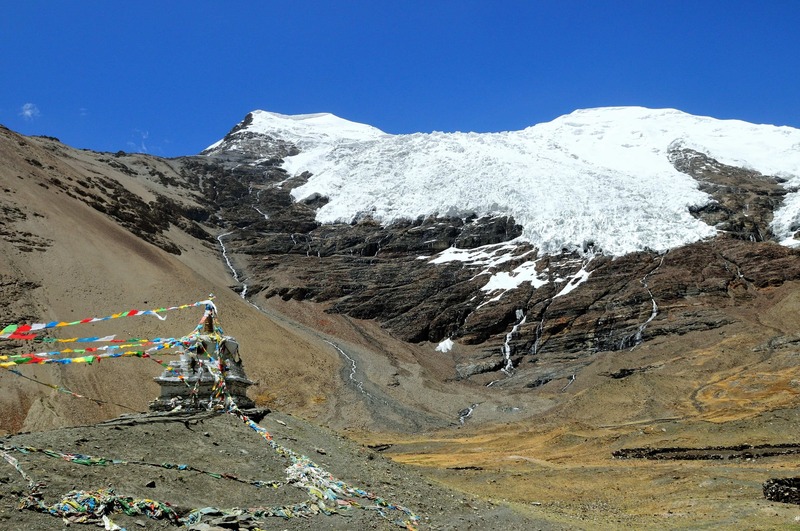 Once you drive further to the West from Yamdrok Lake towards Gyantse, you will pass by Karola Glaciers. These magnificent mountains rise over 6,000 meters. They are always covered with ice and snow. The melting ice from the glaciers feeds numerous streams, that flow into Tibetan rivers. From glaciers, it is a short drive to Gyantse. This town was once the third largest town in Tibet, and you can still see some of the most impressive architectural structures there. The most famous attractions in Gyantse are Pelkor Chode Monastery, Kumbum Stupa, and Gyantse old fort. 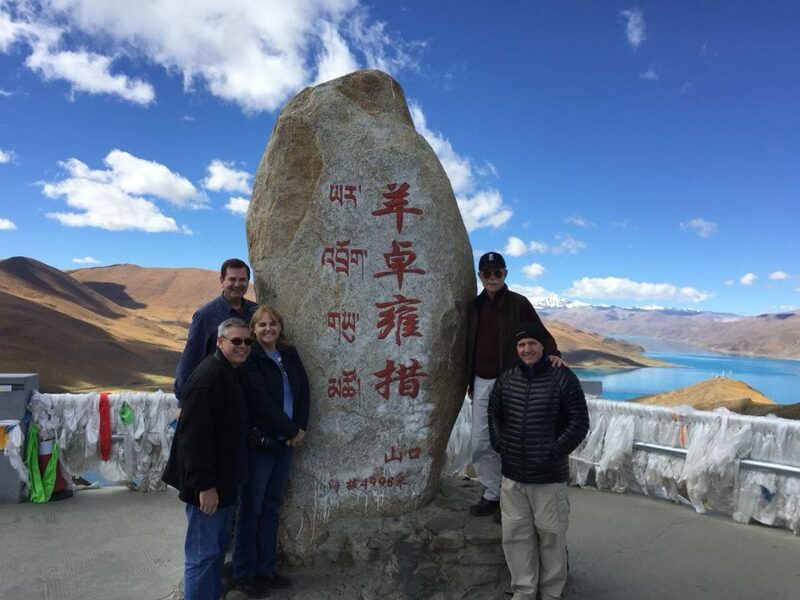 This private tour starts in Lhasa, where we spend the first three days acclimatizing. While in Lhasa, we visit UNESCO World Heritage sites: Potala Palace and Jokhang Temple, and two main monasteries in Lhasa: Sera and Drepung. After that, we will drive to Yamdrok Lake, one of the sacred lakes in Tibet. 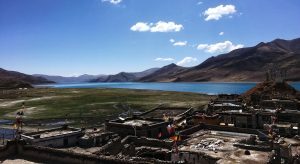 We will spend time enjoying the views of the gorgeous lake, and return to Lhasa. Beautiful natural surroundings of the Yamdrok Lake offer perfect campsites. 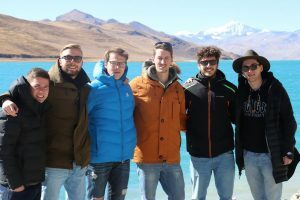 We will spend the first few days in Lhasa to acclimatize to the altitude of the Yamdrok Lake. Then we will drive towards the lake. We will make a stop at the high pass to take the photos of the lake, before heading down to the lake shore where we set up our tents. After that, you will have enough time to go on short hikes, visit Samding monastery or just relax and enjoy the beauty of the lake.